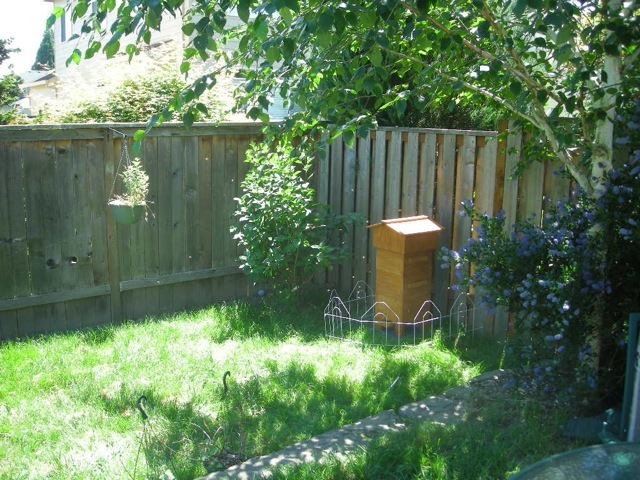 I received some Warre hive photos from a fellow recently that lives in a suburb of Portland, Oregon. He built a Warre hive last spring and populated it with bees from a shook swarm. His hive is located in his city backyard where there is plenty of flowering plants, flowers and trees for his bees to forage on. Brenden told me that his bees filled two hives boxes with honey comb in five days! As you can see, Brenden chose to build his hive out of 3/4″ plywood coated with a weather and water sealant. Plywood is inexpensive and durable, however it does contain glues which may over time emit gases into the hive. Brenden said that does not bother him. I happen to be a little leery of plywood, though. To each his own! Brenden’s Warre hive had so many bees in it that they created a beard at the hive entrance during the high heat at the time. 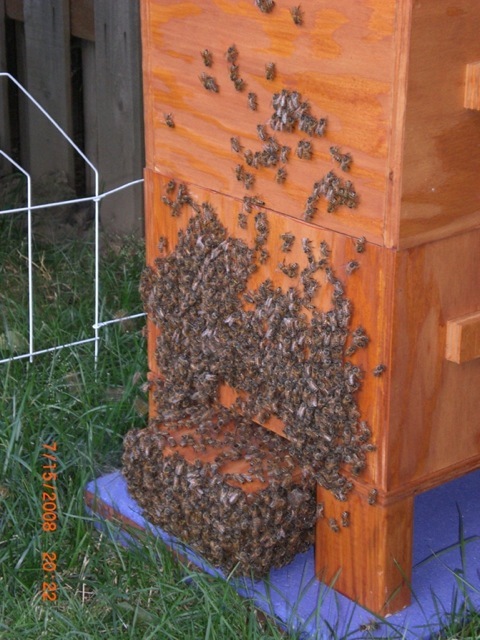 Honeybees will do this to help cool the hive. Brenden told me that he thought his bees were going to swarm, even though they had plenty of space to build honeycomb. He snapped this photo of the bee beard. That is a lot of bees! There is so much flora and fauna in the city that Brenden’s Warre hive is now five hive boxes tall! Each box is packed with honeycomb, honey, pollen, nectar and honeybees. I bet that his neighbors appreciate the pollinating that the bees do for their flowers and gardens. Who knows, maybe they will be interested in keeping bees themselves? Having a beehive in every backyard would go a long way to increasing the numbers of honeybees in our cities and suburbs. Thanks to Brenden for the great photos! 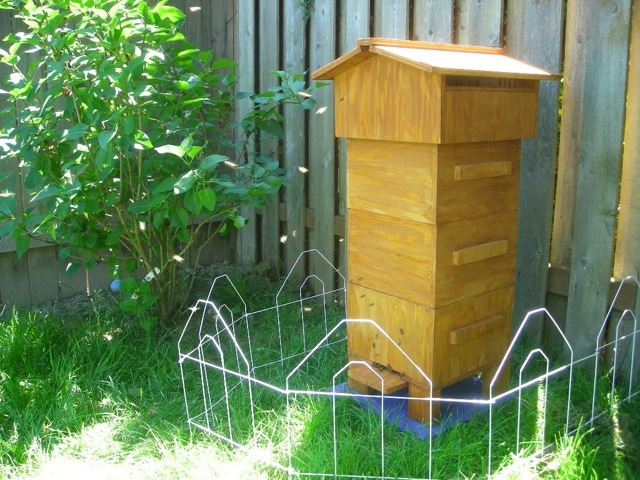 This entry was posted in Honeybee Photos, Warre Hive and tagged beekeeping in the city, diy beehive, emile warre, Sustainable Beekeeping, Top Bar Hive, Warre Hive. Bookmark the permalink. Nick, I’m puzzled. How could he possibly know that his bees drew two boxes of comb in five days? How could he know that they needed another box added at the bottom? How can you tell this stuff, when you can’t look inside the hive? Help? How did the Warré hive work out in Portland? 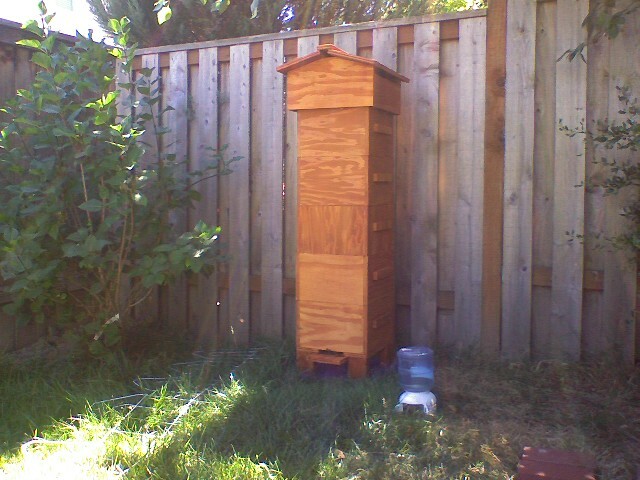 I too live in the coastal Pacific Northwest and am considering this style of hive for my second hive (first is a classic Langstroth type), so would like to see how they have worked for other backyard beekeepers in this area. We live in Colorado and have a working Warre hive. We built each box with a window on the back side of the box that has a cover, so we can peek in and observe without being in the bees’ way or path. They too are now at 5 boxes high! We have observed each step of their process and can monitor them closely. Much easier than our Langstroth hive. I have been assisting a new beekeeper for three years with her Warré, and what a frustrating disaster it has been. Because you cannot inspect, you cannot monitor swarm prep, cannot remediate the swarm impulse, and cannot spot disease, pest or crowding issues. We have rescued the setup many times from the brink of disaster but this spring…one of the best in bee memory for pollen and nectar flows…it swarmed and as 20% of hives on average do, failed to requeen. That was the death knell. Go Langstroth, not only because then you can help your bees (be a beekeeper instead of a bee haver, as they say) but so you can enjoy looking into the hives and experience the wonder of participating in hive life. Sorry to hear of your troubles westernwilson, I don’t know the specifics of your friends situation but if your treating her Warré like it’s a Lang then you are bound for failure. Top Bars are a natural unobtrusive approach to keeping bees. I won’t argue the benefits of either as there are plenty of people arguing about it on other forums. I will add though that the bees have done a great job taking care of themselves for millions of years and they didn’t need our help to do it. You don’t need to intrude their home to experience the wonder of hive life. I am sorry to contradict you Nick but this is not the niche, let alone the world, the bees evolved into. We have taken them out of Nature and given them problems their genome is not suited to handle (Varroa, foulbroods, pesticides, new biozones, degraded and diminishing forage opportunities). The idea that they can take care of themselves is no longer applicableL and since we got them into this mess (and are dependent on honey bee pollinated crops), we should be responsible for keeping them going AND correcting our mistakes. Right now, right here, colony health and vigour is entirely dependent on having an attentive and informed beekeeper. That is sad, and regrettable, but it is a fact. We did not “treat the Warré like a Langstroth”, but we did have to add bees and queens on a regular basis, treat for mites (difficult in a Warré), feed them (we have a late summer dearth, no fall flow), split them, apply swarm control etc. The Warré setup made helping the bees that much harder to do. Without our interventions the hive would have died out in its first season. No worries westernwilson, even though we might not see eye to eye on some things we are all fighting the same battles brother. I agree with a lot of what you say as far as the evolution of the bees and our role in it but as with most things ‘what works for one may not work for another’. I’ve had many many successful Warré hives in a couple of different states and have talked with many that had that have experienced the same. 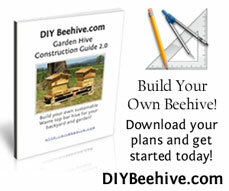 If you get a chance download and read Beekeeping For All, I have a link in the sidebar. It’s a good read. Good luck to you and thanks for your comments! I have read that and thankyou for the link. All beekeeping is local and up here in the cold and rainy PacNW, in bee dense areas, rare nectar flows and a lot of foulbrood and mites around, Warré hives are a tough go, for bees and beekeeper. At least start in a Lang so you get to know the arc of the colony year.